Kabukibu! – Hey, Kids, Let’s Put on a Show! I’ve got more to say of course, but to sum it up? It’s all good – every bit of it. Kabukibu! seems like a good bet to be this season’s “that really good show nobody watches”. Well, I hardly think I could have been more right – though to be fair, the latter was going to be pretty much a given. It wasn’t a given that Kabukibu! was going to be really good of course, especially given that it’s based on a light novel. But I just had a gut feeling – the stars were aligned. Kabuki is an interesting topic, Deen has proved itself quite savvy at attaching itself to good source material, and they brought in an outstanding director and writer (both of whom were willing to take on the project when they surely had options). I love covering shows like Hunter X Hunter and Boku Dake ga Inai Machi, because the main enjoyment factor for me comes in writing about shows I love, irrespective of whether they’re popular. But it’s with the under-appreciated gems like Kabukibu! that my pride in being a blogger really wells up – I’m glad there’s a group of readers out there who appreciate anime that’s widely ignored. I wish more of the wider audience did too, but at least shows like Kabukibu! can find an audience – however small – thanks in part to aniblogging. I had a pretty strong feeling that we were going to be treated to an outstanding finale here, and I certainly wasn’t disappointed. The staff here know how to do an ending, and this series has been trending unidirectionally upward for most of its run. This episode delivered pretty much everything you could have wanted – apart, perhaps, from (not to beat a dead horse) Kurosu actually appearing on-stage. But it delivered up some satisfaction in that area in the way I hoped it might, and everything else about the performance of “The Five Bandits” was a masterpiece. I can totally understand the look of rapt awe on the faces of those incoming first-years. The first order of business was to get Ebihara as part of the Kabukibu’s production, but he didn’t make it easy. It was only on the way home after being rejected (I loved Shin growling at the dog) that Kuro was struck by inspiration – play dirty. He threw the fact that Jin had likely gotten Riri sick in his face, and pretty much shamed him into appearing with the kabuki group. But dirty or not, he’s actually got a pretty decent point – and besides, Jin was pretty much being a jerk about the whole thing at that stage anyway. I’ll give Ebi-chan credit for this – once he decided to perform, he clearly took it seriously (for his own sake, if nothing else). He insisted that he’d be playing the part as a high school student, not as the heir of the Shiroganeya Clan (that’s an interesting philosophical distinction if you think about it), and proceeded (after a read-through) to give everyone on the cast one point to try and fix in their performance (apart from Kaoru, who he knew could handle more). Most interesting here, of course, was that Jin gave Akutsu-kun no pointers – he claimed it was because “I don’t like you”, but one suspects it was more likely that Shin was already pretty good. Or perhaps, that his strength is in his raw energy and magnetism – and anything Jin tried to do to tame that in one day would do more harm than good. And that performance – wow. It took up almost half the episode, and well it should – it really made me want to see “The Five Bandits” live myself. Everything clicked (starting with Tonbo’s smile and assertion that he was having fun) – the subtitles, the gymnastics, the backgrounds… It was a perfect marriage between brilliance and believability. This performance didn’t look like a professional kabuki production – it looked like a kabuki production put on by exceptionally talented and creative enthusiasts who had everything go just right. And boy, did it ever. 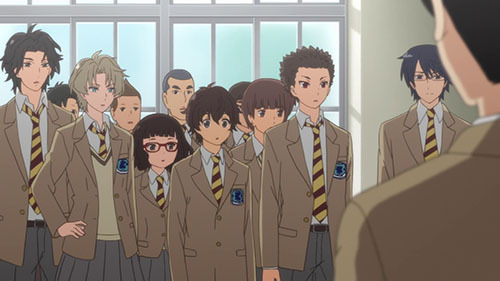 There were a lot of tidbits I could single out from Kabukibu!’s take on “The Five Bandits” – each of the five character introductions was pretty riveting, for starters. But most interesting to me was that moment when Jin stole a quick look at Jin as he was introducing himself as Nango Rikimaru. I love the fact that Yoneda-sensei doesn’t dissect that, but rather lets us ponder on it. Just what was the significance of that for Ebihara? For me, I think it was an acknowledgement – a recognition that for all his dismissive derision, there was a genuine prodigy at work here, a potential star. And so much of that comes down to Ohsaka Ryouta, who – it must be said again – is superb in this role. He’s really good at kabuki for starters, and clearly that makes a huge difference. In the end, though, the moment that hit me the hardest was when a the end of the performance, as the cast was taking their bows with Kuro way off in the wings, Shin introduced him and the entire club saluted him (and the audience, too). Kurosu teared up a little and frankly, so did I. If we weren’t going to see Kuro actually take a bow as a performer, it was critical to a satisfying conclusion that we see his efforts acknowledged and applauded. People like Kuro do exist in the world – they make things better for those around them with their tireless enthusiasm, work ethic and positivity (and talent, too). He was the perfect protagonist for Kabukibu! – he matched its personality in the same way Onoda Sakamichiu and Oota Shou matched that of their respective series. In the final analysis, we’re back where we started – it’s all good. Kabukibu! ended up being a wonderful, uplifting experience – straightforward and optimistic and full of the joy that comes from watching characters you like do something they love. As terrible as most light novels are, this is a good reminder that exceptions do exist, and that they deserve to be recognized. The problem of course is that it’s not LN adaptations like Kabukibu! that end up making money, so they’re almost non-existent. But that doesn’t take anything away from the accomplishments of this series, which ended up being one of the best of the season. I’m gonna be completely honest: Apparently, I’m not that adept at reading every single thing this site’s anime season preview has to say, because I have been completely unaware of the existence of this anime. Had I been, I would’ve definitely watched it, simply cuz I happen to love anime about Japanese traditional forms of entertainment, like Karuta and Rakugo (2 guesses on which anime depict them). Just goes to show you how reading ALL of the preview is essential to make sure stuff like this don’t go unnoticed. Thanks for this final post Enzo. I’ll make sure to watch this. Lol. I didn’t there’s an anime like this this season. Both of you pretty much proving my point, ROFL. Fortunately you can marathon it. FTR (in addition to blogging it on LiA) I did do a Kabukibu! intro post on RC. what about animation? Is it good or bad? It’s pretty good Shirocat. If you were wondering about the image Enzo has put up, it’s a bit fuzzy for some reason. Click on it to see what the original article was like! I know people love to rip Deen for their production values, but those days are mostly behind us. I mean, look at what they did with Shouwa Genroku. Kabukibu! isn’t on that level but the art and animation are quite solid. Character designs by CLAMP, which is interesting if nothing else. Another odd note about this series – Shimono Hiro sings the OP. I have no idea why. I think DEEN probably got a bad reputation because they likely weren’t given much of a budget to produce some shows they were contracted for. Log Horizon Season 2 had some moments of decent animation, but was mired in mediocre animation in general. They can clearly produce some good stuff when the money is there. I watched the first 3 episodes and I was not amused. Even though I really like unconventional anime plots. I found out about Aki no Kanade yesterday, its about a girl in a taiko group, trying to download the rest of the series, its a very good one. Man, I really want to watch this anime legally, but I cannot bring myself to add Anime Strike, nor will I watch it illegally. I guess I will have to wait for it to come out on Bluray. I’m glad to hear it ended up being great. Amazon seems intent on owning anime just because they can. I wouldn’t be as mad if it was a Prime exclusive show, since I have Prime already, but adding the additional paywall to it is a load of horse poop. just finish binge watching the series, on a working day night.. and i love it! it was not as great as rakugo, that one is really hard to beat.. however i love how the anime come together.. at one point of the anime, i feel like Akutsu should be the main protaganist with all the focus on him and his developments, but Enzo is right; it was Kuro (and his coffee-dance Tonbo) that tie them all together and the driver to make the kabuki group happened.. as the show curtain closed down, i felt like overally the series is somewhat similar to kabuki itself; it is just a snippet/trailer; there’s more to the story but that’s not the point, as what Kuro had mentioned in one of the earlier episodes..